Flight SQ632 touched down in Narita Aiport, Tokyo as I peered out of the window into the cold, wintery morning. The sun had just begun to rise on the horizon which made for a spectacular view as the airplane was descending: a vast expanse of slate grey ocean, beginning to catch the warm glow of the rising sun, speckled with a few lights from ships and boats. The temperature outside was a frosty -3 degrees centigrade. Immigration and customs were a breeze and I took the Airport Limousine bus service to my hotel. 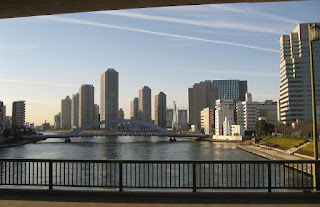 Downtown Tokyo is about 120 mins from the airport and costs about 3000 yen (approx . US $25). The ANA hotel is a huge 34-storied building with half a dozen restaurants and bars within its premises. 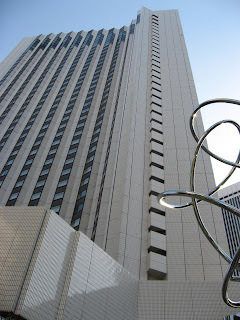 ANA (which is owned by the All Nippon Airways) is entering into a partnership with InterContinental, and therefore starting April 2007, the hotel will be rebranded as the ANA InterContinental. My flight from Singapore had a brief stop at Bangkok's spanking new Suvarnabhoomi International Airport. While the terminal building itself didn't seem particularly impressive to me, the airport and the roads feeding into it, as seen from the night skies, seemed extremely well planned. I haven't yet ventured out of my hotel as I write this, so here are a a few pictures: on my way to the hotel, the imposing facade of the hotel, and a close-up of the high-tech electronic toilet in my bathroom!! Yeah, the technology in the toilet seat is both funny and impressive. It has sensors that can detect when you sit on it, an exhaust fan starts automatically somewhere (under you! ), and your rear end is going to appreciate the warm water 'bath' with adjustable pressure! 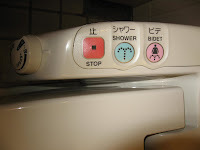 good explanation about the gadgets used in the Japanese bathrooms!..am rolling with laughter reading abt it:-) BTW, on which floor of ANA did u stay?